Rodney Leer, Brenham Independent School District, USA "CACHEBOX has helped our district save bandwidth." Denise Paustian, Durant Community School District, USA "CACHEBOX boosted network performance and reduced bottlenecks. Loading issues across devices are all but gone." As well as managing CACHEBOX’s primary job – caching web content – you need to take care of the “housekeeping” – deploying, managing and maintaining the server in your network. CACHEBOX makes this easy too! Working with CACHEBOX, you will immediately notice all the smart administrative features – logging, backup/restore, reporting, alerts and so on – which make it much easier than working with a general purpose server. But you might not notice what’s happening in the background. 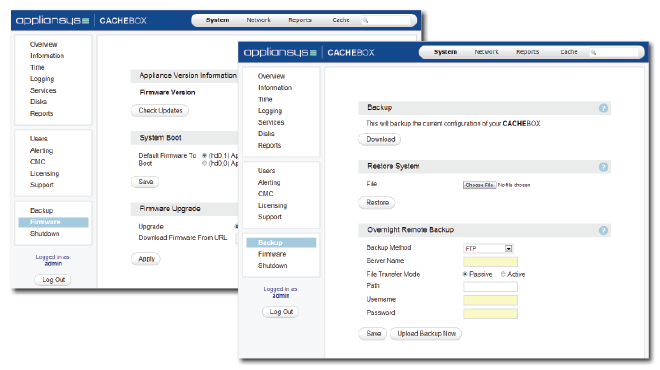 CACHEBOX software self-manages, checking what is happening in the appliance environment, and responding to events – for example by automatically restarting on-box processes which stop unexpectedly. The result is a more robust cache service, with less need for server administrator intervention to keep things running smoothly. 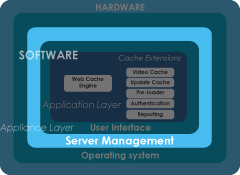 CACHEBOX supports the automated logging of system-level messages (authentication, operating system, hardware and networking). These logs are for fault diagnosis; there is no need to review them routinely. CACHEBOX performs its own maintenance functions and remedies for temporary problems. Cache log files can be scheduled to be automatically uploaded to an FTP server, windows file server or Linux/Unix/Apple server running Samba on a daily basis. This allows logs to be analysed off-box and centrally stored to meet data retention laws or auditing requirements. 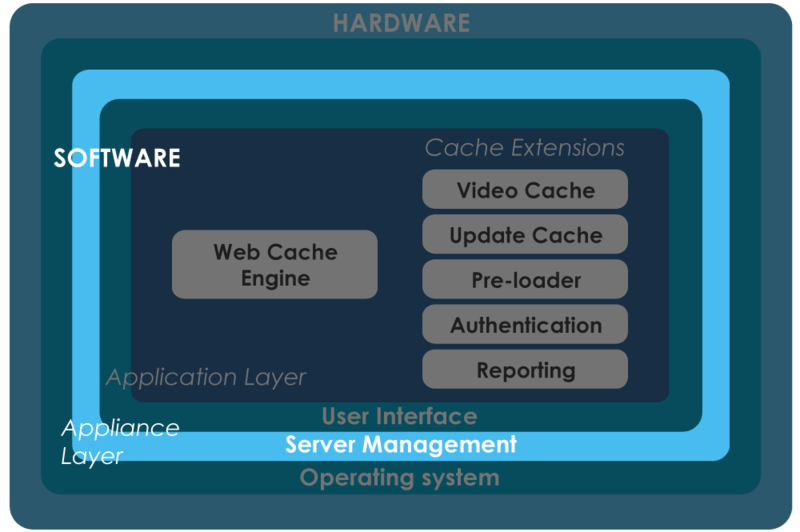 CACHEBOX gives you comprehensive information on the appliance – status of disks, CPU, memory, I/O, services and so on – and on network latency and throughput. CACHEBOX can be configured to send alerts by email, SMS or SNMP to keep you up to date with events relating to hardware, system, service events or user authentication. CACHEBOX can be configured to allow Simple Network Monitoring Protocol (SNMP) requests, allowing you to monitor CACHEBOX status and performance or create alerts using network management software. 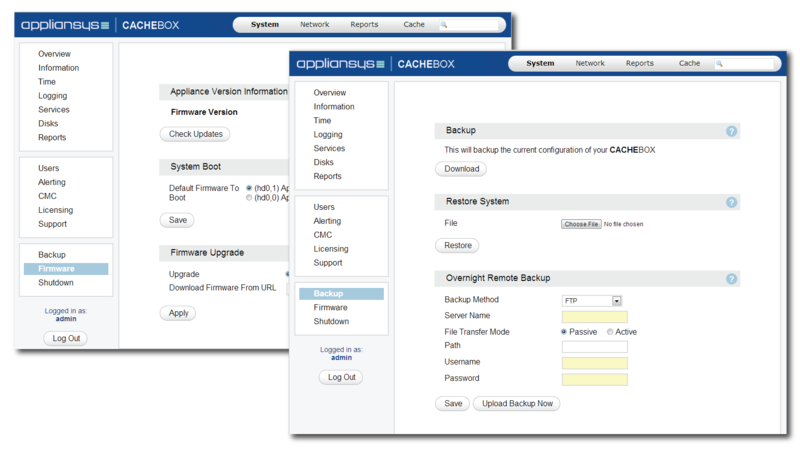 When an update is applied, CACHEBOX retains a copy of the previous firmware. If, for any reason you want to switch back, you can do so easily. Scheduled reboots can be used when upgrading firmware. You can download firmware updates during the working day and schedule them to be applied during off-peak hours to minimise any impact on your caching service. CACHEBOX is built to be administered by multiple users: The web admin system allows you to easily add new users, assign roles and delegate responsibility. Users are authenticated either locally, or via RADIUS or LDAP. CACHEBOX’s web interface uses configurable certificates to protect itself from ‘eavesdroppers’, ensuring that only people you allow can access your network data. It also lets you control which machines or networks can access the user interface. Faster web a DoDL with CACHEBOXCACHEBOX Fala PortuguêsNevis says never to slow internetCACHEBOX hot in Chile university¡CACHEBOX ya habla español!